The ISOFIX base included simply connects to the cars ISOFIX connectors and allows for a simpler installation by simply clicking the car seat in place on the base. Featuring a Tri-Protect headrest with patented Intelli-Fit™ foam provides side impact certified protection – along with all the latest and greatest safety features. 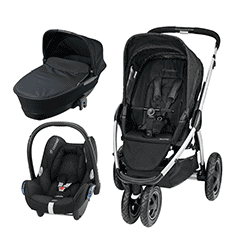 Compatible with Joie Mytrax, Chrome, and Litetrax 4 pushchairs, and with other pushchairs using Maxi-Cosi car seat adapters it can be easily converted in to a handy travel system when out on the go.